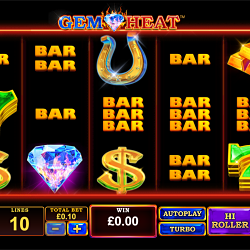 There’s a brand new arrival to Betfair Casino’s slots library; Gem Heat. Spin the reels of this popular Playtech game and you’ll receive 30% of any losses you accrue back in the form of bonus bucks! This offer is a strikingly simple one. Play Gem Heat and 30% of your net losses will be refunded to your account- up to a maximum of £100. The bonus is valid for any of Betfair’s many great casino games; so if you really loved spinning Gem Heat you can try your luck there yet again, you could also stake it on one of the site’s other incredible slots such as Tiki Paradise, Matrix and Justice League. Or perhaps you’d prefer to play on more traditional table games like Roulette and Blackjack. You only have to spend £10 in Gem Heat between the 6th and 12th of December to be eligible for your 30% bonus back. Claim your offer by heading over to Betfair’s promotions page and clicking on the ‘activate’ button. As soon as you’ve this, you’ll be opted in and ready to spend a minimum of £10 on Gem Heat safe in the knowledge that any unlucky run will be refunded up to £100. The Playtech team have clearly taken their inspiration from good old-fashioned pub fruit machines for the design of Gem Heat. The classic slot style has been given a shiny new upgrade for this game which comes complete with special bonus features including frozen wilds and an expanding multiplier. The visuals in this game are totally traditional. Symbols such as double bars, horse shoes, shiny dollar signs and gold bars are set before a flame-covered backdrop. All of this imagery is laid out across five reels and 10 pay lines. You can play for between 25p and £2,500 per spin- with the possibility of upgrading to Hi Roller mode for more symbol upgrades. Keep your eyes peeled for the Gem Heat game logo as you play. This is the scatter symbol so it has the potential to trigger some winning combinations. In addition to this, the Gem Heat icon is also the key to unlocking the free spins feature. When this bonus round kicks into action you’ll receive 10 spins with expanding multipliers of 3X, 10X or 100X on top of any wins. Throughout these freebies, a diamond wild will be frozen in place on the middle reel- boosting your chances of landing a winning spin. The 30% bonus back promotion is open to all registered members of Betfair Casino. The offer is valid from December 6th until December 12th. The promotion is limited to once per household, IP address, email address, telephone number and bank account. There is no wagering requirement attached to the 30% bonus, but it must be played through within seven days. After this time the bonus will be revoked.